Gulf Coast Educators FCU is committed to making our community a better place. Every year the credit union and our employees donate thousands of dollars to local schools, education foundations, and charities in the hopes that we will make a difference in the lives of our members. Our team is dedicated to giving back to the community. 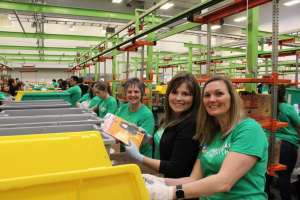 In addition to our volunteer efforts and donations with education foundations and schools, we give to local charities through employee donations. Our employees work hard every day to provide excellent service and to ensure that your money is safe and secure. Because of their efforts, the credit union has won many prestigious awards. Money Talks is a forum for discussing topics related to our members’ money. The credit union has four Certified Credit Union Financial Counselors who will post articles along with other employees. Every year GCEFCU presents scholarships to 4 qualified graduating seniors. Click the link above to see the qualifications and deadlines for the application. We love giving back to our community and schools whenever we can. If you believe there is an opportunity for GCEFCU to give back in a way that coincides with our mission, please let us know.